Is there anything that signals the end of summer more definitively than﻿ the smell of fried cotton-candy-wrapped corn dogs, or the sound of a carnie taunting that you don't really love your children unless you win them a crunchy stuffed Garfield plush, all punctuated by the hacking cough of a stranger two inches from your face and the constant threat of being crushed to death by a ferris wheel that's broken loose from its moorings? I realize many of your children have already gone back to school, but that's probably exactly what has sent me into an End Of Summer Panic resulting in an attempt to cram every single activity I've been putting off for two months into the span of a few days. Thus, a trip to the county fair! Ta-da! This is a real thing - try wrapping your mind around that. 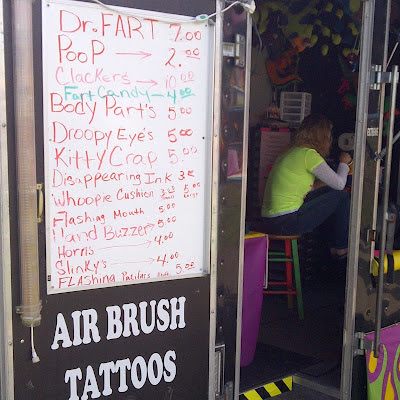 I love this booth, which offers "Kool Tattooz," as well as the ala cart menu items pictured here. I love it because it raises so many questions. Who, pray tell, is Dr. FART? Why is PooP $2.00, while Kitty Crap is $5.00? Why was Fart Candy so hastily squeezed onto the menu in a different color marker? What exactly belongs to the Body Part, Droopy Eye, and Slinky, as I'm assuming that the Tattooz Artizt knows that "apostrophe s" IS POSSESSIVE??? Does this serve as a list of the tattooz you can get? Because if so, please sign me up for a PooP! In addition to being just a barrel of fun, it also occurred to me that the fair has a practical purpose, beyond teaching the children that the Poultry Barn has, bar none, the foulest stench of any place on the planet Earth. And for the record, technically "foulest stench" doesn't count as another pun because I didn't spell it "fowlest." ﻿Anyway, believe it or not a trip to the fair actually helped us prepare ourselves for the school year. What do you mean you don't believe it??? I was afraid of that, so I made a chart to see if I could sway you. See what I'm saying? I'm not telling the kids, though. Knowing them, they'll use this chart to try to convince me to go to the fair again next year. I know I'm not fooling anyone - by next August I'll be dragging the kids to the fair so I can get my fix of batter-dipped funnel cake pork fritters. Mmmmm. Please click to vote for me anyway. We're hitting our fair tonight too. And let's be honest, I pretend it's for the kids, but Mommy needs her GINORMOUS milkshake and fried veggies. All the school prep is just a bonus. That's how I felt about it - a total afterthought following the butter-on-a-stick gorging frenzy. So funny Robyn! Those tatoos are something else, my 8yo would be in stitches and begging for one. Strangley there was no one in line waiting for their tattooz, which is something I'll never understand. I think every mom should be required to tattoo "PooP" on their body somewhere. Agreed - we all have poop on us at some point anyway. Might as well make it official. I've never seen the show; I'll put it on the list! Okay. I'm extremely jealous of your fair's tattoo booth. Where do you live, because I'm on my way?! Sadly, we have started school already but thanks to this post, I'm craving elephant ears like nobody's business. Thanks for the morning laugh(s)! Isn't that the saddest thing? I don't think it should be legal for them to make delicious food that you can only get once a year by trudging through a filthy hell-hole filled with screaming kids high on chocolate-dipped cotton candy and pimply teenagers who are only there to hook up with other pimply teenagers. What happens when I want an elephant ear in January?!?! Not cool. Fortunately for me, my kids don't know about the fair, and hopefully I can keep it from for another 18 years. Just then, I might be okay with it, but more than likely....I won't be. If OUR fair was any indication, we won't have to bother accompanying our kids to the fair by the time they're about 15. And if the skimpiness of their clothing was any indication, those 15 year olds aren't at the fair to enjoy a frozen lemonade and take a spin on The Himalayan. IfyouknowwhatImean. Of course we won't be okay with that, either, so we might have to just move to a country without county fairs. "They risked their lives on rickety rides built in 1912..." Ha, ha, ha. I always think the rides at the fair are hastily put together and wonder if I should've made a will before getting on them. What about your collection of pretty scraps of paper? They are sure to cause a rift if not properly doled out. Don't be crazy - you know I need to be buried with my scrapbook supplies! Oh my Zeus. It's even funnier reading about the fair than it was going to it with you. Of course, horrid experiences are always more amusing when reminiscing about them. Even better to read than attend - no screaming children, half-clad teenagers, or smelly unidentifiable piles of whatever on the ground to navigate. Hysterical. Seriously. That sign is crazy. Did you find out what any of that really was? Is somebody walking around with a pile of poop tattooed on one arm and Dr. Fart on the other? Because I want a picture of THAT. Very funny post, as always! Thank you much! I *think* the sign was referring to a small table of jumbled up junk, presumably high Quality Novelty Items, but I didn't want to get too close for fear she would airbrush Poop on my forearm or adorn me with face paint to look like Dr. Fart. I'm so glad you caught the Apostrophe Catastrophe. I had the same problem with my daughter. She's 7. What's the Tattoozzzzzssmka Artizt's'ss excuse's? May the school bus be with you. I have the same problem with MY 7yo daughter - and I'm willing to bet the Tattooze Artzizt's would be just as interested in being corrected as she always is. Yours is clearly a better deal, though scotch tape and blue eyeshadow could only serve to improve my situation. Which is scary. Ha! 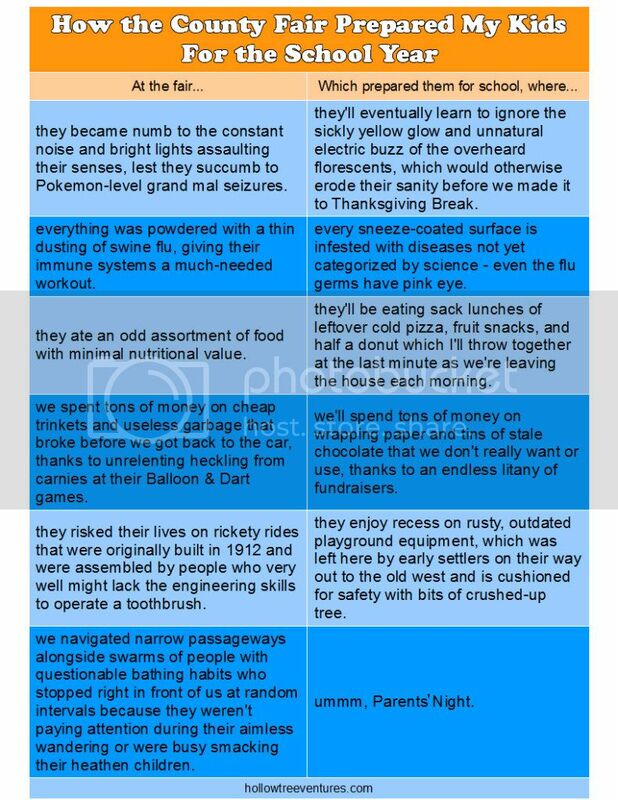 You're right...you HAVE to do these things to get your kids ready for life. I know, it's one of those parenting requirements, like changing diapers or guzzling wine as soon as the kids fall asleep. You don't WANT to, but as parents it's not about what we want anymore, it's about what keeps the family unit functioning.